Team Reynolds of Lodi Curling Club at the Annual Midwest Curling Association’s Bonspiel held in Madison in December 1951. Fragmented records indicate that there was a “Chicago Curling Club” from 1855 to about the 1900s. Their ice was outdoors on the lagoons of Jackson Park on Chicago’s South Side. Definitive proof of Chicago Curling Club’s early existence can be found in the medal collection at Milwaukee Curling Club, which was founded in 1845. Chicago Curling Club’s name is inscribed on certain medals in Milwaukee’s collection which implies that the clubs engaged in competition. The oldest Illinois curling club with a continuous history is Waltham Curling Club located in Triumph, Illinois. In 1884, John Currie of Ayrshire, Scotland came to the United States to visit relatives who had emigrated from Scotland to the farmlands north of the Illinois River. An ardent curler, himself, Currie suggested curling to the community of Triumph. At first, the club even used wooden blocks instead of stones. The first “modern” curling club in the Chicago area was established in 1936 at Indian Hill Country Club, in Winnetka. Skokie Country Club of Glencoe and Exmoor Country Club of Highland Park took up curling in 1938, as did The Glenview Club in 1940. On Feb 16, 1945, a small meeting of enthusiastic curlers was held at Detroit Curling Club with the purpose of organizing a mid-western curling association. Mr. Ewart W. Watson, director of the Detroit Club, presided over the meeting where representatives from the regional clubs discussed creating a parent association that would work to encourage the growth of the sport in the region. The main objectives of the organization would be to standardize equipment, provide support so clubs could have longer seasons and better ice, and create a championship event that would allow the region to compete for U.S. titles. The Midwest Curling Association (MCA) was officially established later that year. The organization represented more than 40 clubs from Nebraska, Ohio, Minnesota, Wisconsin, Illinois, Michigan, and North Dakota. 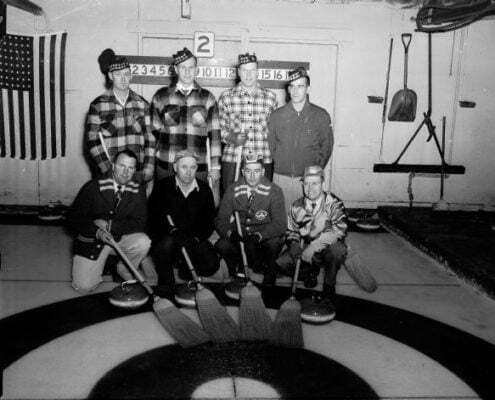 In 1948, the St. Paul Curling Club hosted the Midwest Bonspiel and the Midwest Curling Association’s annual meeting. At the meeting, the association continued to strive to promote, grow, and improve curling programs in the Midwest and across the United States. 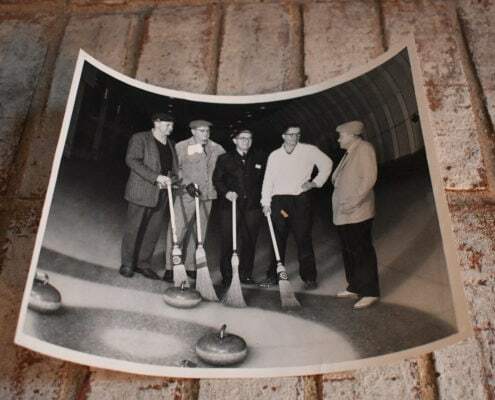 Curling was organized at North Shore Country Club of Glenview in 1951, at Oak Park Country Club in 1955, and at Saddle & Cycle Club of Chicago in 1958. Indian Hill led the way with indoor ice in 1954, followed the next year by indoor ice at Skokie, Glenview, and North Shore, at Exmoor and Oak Park in 1957 and at Saddle & Cycle in 1960. Later, Indian Hill and Glenview combined their curling facilities in a new building on the grounds of the former club. Illinois was host to the first United States Curling Association Men’s National Championship which was held in the Chicago Stadium in 1957 through the encouragement and sponsorship of Hughston McBain. Illinois teams have participated in the Men’s National Championship since that time. By 1967, the Curtis Curling Center, a six-sheet, public facility, was opened with a private club, Wilmette Curling Club, based there. Collection of Midwest Curling Association Mementos. The Illinois Curling Association came into existence when the Midwest Curling Association voted to dissolve on May 23, 1964. Illinois was advised that their membership in the United States Men’s Curling Association no longer existed and if they were to belong to that organization, they would have to organize their own state curling association. Illinois previously had organized a Country Club Curling Association to which most of the clubs belonged. This association was absorbed when the ICA was organized on June 29, 1964, at Skokie Country Club with Ralph Trieschmann as its first president. 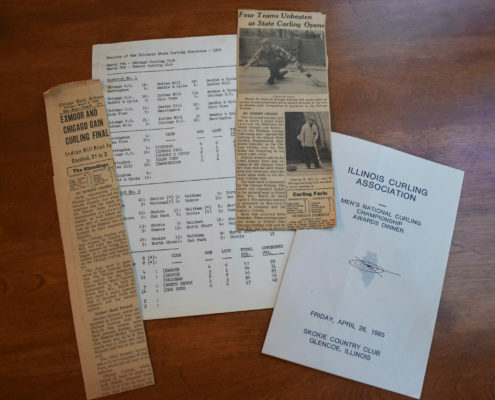 The association was organized as a non-profit organization to promote the sport of curling and to help coordinate the various Illinois bonspiels. Years later, the first Illinois Curling Association website was launched by Bill Johnson in 2002. Cedar Rapids Curling Club and Des Moines Curling Club, both in Iowa, were added to the ICA in 2014. The following year, the St. Louis Curling Club joined the ICA. As of 2018, the Illinois Curling Association reverted back to the Midwest Curling Association and now represents nine curling clubs across Illinois, Iowa, and Missouri. In addition, the organization has also launched an updated website and Facebook page.